Thousands of Bangladeshi garment workers protesting over low wages and soaring food prices clashed with the police on Sunday during fresh protests over low wages and soaring food prices. “They smashed dozens of vehicles, attacked nearby factories and pelted stones and bricks at our officers. Police fired shotguns to disperse the unruly workers,” police chief said. Four protestors, including two with bullet wounds, were admitted to Chittagong Medical College Hospital A nurse said. Bangladesh’s garment industry employls about 2.5 million workers, or 40 percent of the industrial workforce, and accounts for about 80 percent of the country’s export earnings. The average garment worker earn a basic minimum wage of about 25 dollars a month. Bangladeshi households spend nearly 70 percent of their income on food. Prices for rice, the country’s staple food have doubled in the past 12 months mainly because of floods last summer and a major cyclone that caused severe damage to the crops in November. Unions have demanded a major increase in salaries, saying the existing basic payment fixed in late 2006 has become redundant due to rocketing prices of food and other commodities over the past year. In April, at least 20,000 protesting garment workers clashed with police and 50 were injured. 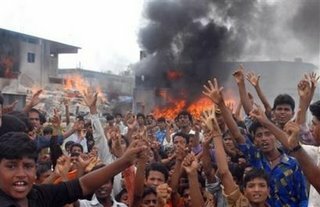 Bangladeshi demonstrators protesting against rising food and fuel prices on the outskirts of Dhaka in April, 2008. Police clashed with thousands of garment workers in southwest Bangladesh Sunday during fresh protests over low wages and soaring food prices. (Image may be subject to copyright. see MSRB Fair Use Notice. About a thousand Kenyan demonstrators protesting against rising food prices were assaulted by the riot police who fired teargas to disperse them on Saturday. Widespread food shortages have led to skyrocketing food prices amid political corruption. Annual inflation rose by an average 24.2 percent in April and May. “The government must subsidize the cost of food, it is not fair for the poor to be suffering with high food prices yet the government has not increased salaries,” said one of the organizers. Disputed presidential election has also triggered violent clashes across Kenya killing 1,600 people and displacing about one half of a million people since December 2007. Food and fuel riots, protests and strikes have erupted this year throughout the “third world” countries in Africa Asia and the Americas including Bangladesh, Bolivia, Cameroon, Egypt, El Salvador, Haiti, India, Indonesia, Ivory Coast, Kenya, Malaysia, Mauritania, Mozambique, Pakistan, Philippines Senegal, Singapore, Somalia, Uzbekistan, Vietnam, and Yemen (other countries may have been omitted inadvertently). Japan: The land of rising . . . err . . . Prices! But Will It Prevent Food Riots in the US?